Want to catch up with today's match highlights? Check out the bitesize highlights below - powered by Suzuki. For more, check out the Suzuki powered extended version below. 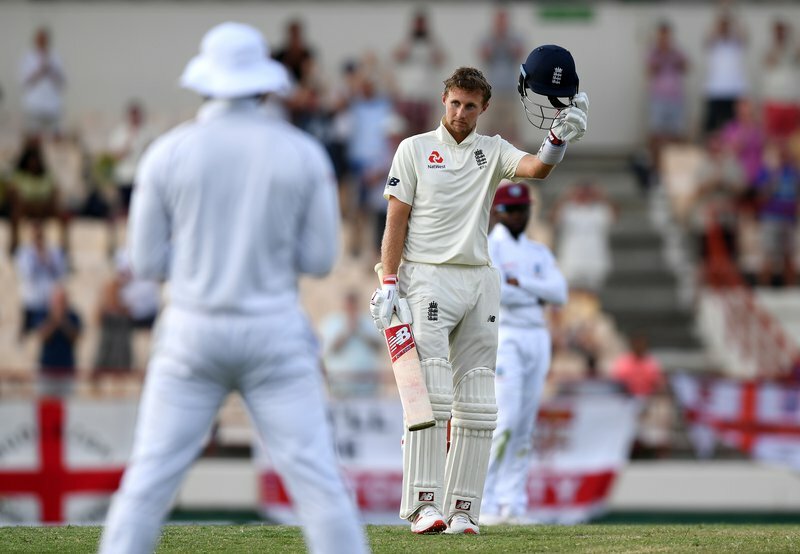 GROS-ISLET, St. Lucia – WINDIES made little headway in their bid for an historic clean sweep of the Wisden Trophy Test Series against England, when Joe Root gathered his 16th Test hundred to put his side in a commanding position in the final Test here. On a rare day of toil in the three-Test series, the WINDIES attack managed just four wickets on the third of the contest at the Daren Sammy Cricket Ground, as Root, the England captain, compiled an unbeaten 111 – his first major score on a wretched tour for him with the bat – led his side to 325 for four at the close for an overall lead of 448. Hamstrung by the loss of Keemo Paul with a torn right quadricep, the WINDIES saw Root shared three significant stands with Joe Denly, who hit a career-best 69, Jos Buttler, whose 56 was his second half-century of the match, and left-handed talisman Ben Stokes, not out on 29. With the highest ever successful run chase in Tests remaining the WINDIES’ 418 against Australia 16 years ago at the Recreation Ground in Antigua, England’s lead has practically pushed the chance of victory out of reach for the home team. WINDIES however, lead the three-Test series 2-0, following a 381-run victory in the first Test at Kensington Oval in Barbados which ended three Saturdays ago inside four days and a 10-wicket victory in the second Test at the Vivian Richards Cricket Ground in Antigua which ended last Saturday on the third day. 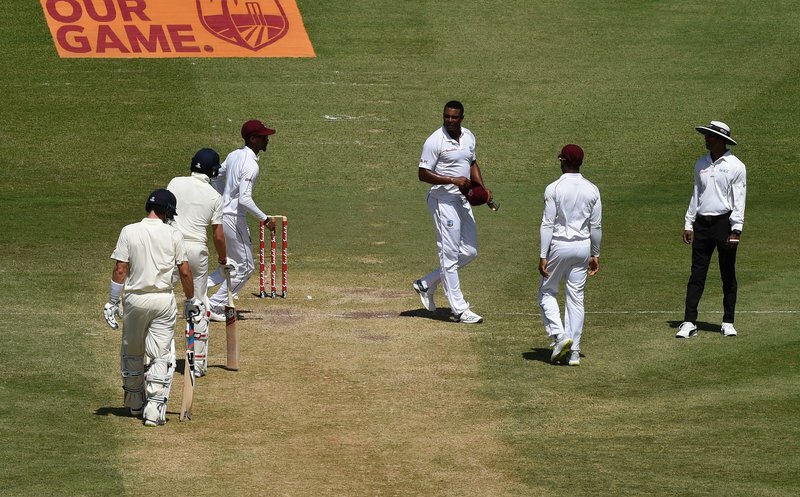 The day started brightly for the WINDIES, when Paul struck with the first ball of the day, having left-hander Rory Burns caught at square leg for 10, clipping a delivery firmly off his legs before England had added to their overnight 19 without loss. Tragically, Paul was soon stretchered off after suffering his injury while chasing a ball in the outfield – and a team spokesman said he would not bowl or field again in the match. The WINDIES failed to find further success for the hour, as Denly and left-handed opener Keaton Jennings combined for a 54-run, second-wicket stand, the first of four successive stands of 50 runs or more for England. Shannon Gabriel however, was the grieving bowler, when Shimron Hetmyer at third slip dropped Denly, playing only his second Test, on 12, after the rookie batsman stabbed at a delivery that lifted awkwardly. Alzarri Joseph got the breakthrough for the WINDIES 40 minutes before lunch, when he bowled Jennings off his pads to leave England 108 for two at the interval. The long, hard grind continued for the WINDIES after the interval, as they managed just a single wicket, as England piled on the pressure to bat themselves into an impregnable position, courtesy of two key stands anchored by Root. With the DSCG pitch playing easier, the WINDIES attack saw Root and Denly score freely to extend their third-wicket stand to 74. A delivery from Kemar Roach was driven to the boundary to carry Denly to his 50 in the second over after lunch, but he fell in disappointing fashion, caught behind cutting at a wide ball from Gabriel, 48 minutes after lunch to leave England on 147 for three. Any hopes the WINDIES had of making further inroads were soon dashed, as Root dropped anchor and combined with Buttler to post 107 for the fourth wicket either side of carrying England to tea at 207 for three. After the break, the WINDIES saw Root collect his 50 with a boundary of Roston Chase’s uncomplicated off-spin and Buttler reach the same milestone before becoming he was bowled by Roach in a new spell in the first over with the second new ball. Still, WINDIES failed to find the combination to unlock the England batting, as Root found Stokes another solid ally and they batted through close to an hour-and-a-half prior to stumps being drawn, but not before Joseph saw a straight drive for four carry Root to his hundred. Enjoying the games? Visit St. Lucia to enjoy more of what this sunny isle has to offer. Let her inspire you!